"It's ok to cry. Crying takes the sad out of you." Bob Odenkirk is half of the comedic force that was Mr. Show. He and former sidekick David Cross have moved on to separate projects, with Odenkirk settling behind the director's chair for the critically acclaimed Melvin Goes to Dinner and his latest, the big studio release Let's Go to Prison. Written by Reno 911! masterminds Ben Garant, Thomas Lennon, and Michael Patrick Jann, this feature comedy flopped during a brief theatrical run, but a bigger audience awaits it on DVD. John Lyshitski (Dax Shepard) has spent much of his life behind bars, and it was almost always the same judge that put him there. Just when he's about to seek revenge on said judge, John learns he has died. The news mentions the judge's son, Nelson Biederman IV (Will Arnett), and John's wheels start turning. He manages to frame Nelson, landing himself in prison in the process, but the ex-con won't be happy until he can enact revenge personally. He pulls some strings and winds up in the same cell as Nelson, whose stay is about to get worse than he could ever imagine. This doesn't deserve a place among the cinematic comedy elite, but it does provide plenty of laughs. Although we've seen countless TV shows and movies based on prison life, most of them don't feature a whole lot of levity. This straight-up comedy doesn't settle for sight gags, as it has a nice edge to it, thanks in large part to Odenkirk, Garant, and Lennon's twisted senses of humor. The story is extremely thin, but it never matters, as each plot point is simply a well-timed device to get us from one bit of witty humor to the next. The music is refreshing also, as I never thought I would welcome the repeated singing of Technotronic's Move This—be sure to listen to Arnett, Shepard, and McBride tackle it during the end credits. Some inspired casting is in play, including Dylan Baker, who's great as the warden, a straight-laced man who infatuated with a certain human orifice that shall remain nameless. I'm still not sold on Dax Shepard, but after exhibiting at least a little bit of charm in this and Idiocracy, he's starting to grow on me. Arnett really shines here in what is essentially his first major starring role. Building upon his unforgettable character Gob from Arrested Development, Arnett exudes the same restrained mania as Nelson. His distinct voice (he's provided voice-overs for numerous TV commercials) can power scenes on its own, and he has a nice rapport with Shepard. It's Chi McBride that virtually steals every scene he's in, though. His is a clich�d role, but there's a rare vulnerability in play, allowing us to actually sympathize with him, if only slightly, when we would normally just write this person off as an all-out bully. The unrated version begins with a funny introduction by a real Sheriff (Dennis C. Stolte) who explains just how realistic and disturbing the film we are about to see is. His comments actually bookend the film, as it's followed by another minute of assessment. However, this is the only thing that separates the unrated version from the R, as the body of both versions has the same running time. This is a little deceiving when it looks like we're getting two different versions on one DVD, but at least we have the film in its complete, unedited form. Image Transfer Review: A 1.85:1 anamorphic widescreen presentation is pretty much what we expect from a recent theatrical release that's light on visual effects. The colors are strong, with natural flesh tones throughout, aided by well-handled shadow and contrast levels. Sharp, detailed images aren't impaired by dirt or grain. Audio Transfer Review: Dolby Digital 5.1 audio is mostly subdued, but the surrounds come to life for a few of the music cues. Violent punches sound realistic enough, while other sound effects and ambient noise is blended with clear dialogue to create a pleasing overall mix. Extras Review: There are a few extras, including an alternate ending and two deleted scenes. The other ending runs for three minutes and doesn't work as well as the original as it's far too sentimental. 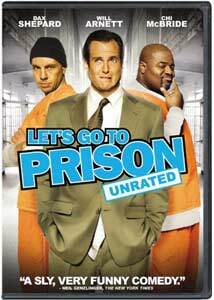 The deleted scenes run over four minutes and include an extended courtroom verdict sequence that features a funny speech by Will Arnett. We also have Let's Go to Prison Soundtrack Sessions, a six-minute segment featuring composer Alan Elliott and director Bob Odenkirk. This pair talks about the film's soundtrack, whose musicians have surprisingly impressive resumes. It isn't one of the funniest films of the last few years, but Bob Odenkirk's Let's Go to Prison is preferable to most of the fluff posing as comedy in today's multiplexes. A star turn by Will Arnett and some scene-stealing work by Chi McBride and Odenkirk himself are only a few of the factors that make this a worth rental at the least. Universal's disc isn't too flashy, but it does the job with solid audio and video and a few fun extras.